Oftentimes when we decide it’s time to “get healthy”, we start by participating in physical activities like going to the gym or playing a sport, but what about activities that keep us mentally and emotionally healthy like self care, stress management or the way we talk to ourselves? When most people hear “health and wellness”, they think of it from a physical aspect. We focus primarily on things we can do to live a healthier lifestyle – like eating right, exercise, getting enough sleep, etc. However, mental and emotional health are just as important to your overall health and wellbeing. 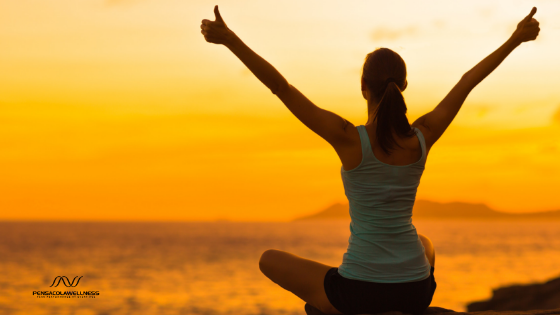 WHY SHOULD YOU INVEST IN YOUR EMOTIONAL HEALTH? Taking care of your emotional health is important to your physical health. When your emotional health is out of balance, it can lead to high blood pressure, ulcers, chest pain and many more physical symptoms – plus it can lead to poor overall wellbeing, difficulty in relationships and mental health problems. It’s important to know that just because you do not have an actual mental health disorder, it doesn’t mean that you are mentally or emotionally healthy. Managing your emotions and mental health is an important skill to have. Staying emotionally and mentally healthy can help you face various challenges, stressors, setbacks and even allow you to be more functional in your day-to-day life. Taking care of your mental wellbeing may sound a little vague or complicated. However, there are some simple activities you can include in your daily routine starting with taking care of yourself! Self-care is essential in your mental and emotional wellbeing. Set time aside for yourself and tend to your emotional needs. Read a book; pamper yourself; put away your devices and take some time to relax and unwind without having to worry about whatever might be happening in your Facebook news feed. Managing your stress is also a vital part of your emotional and mental wellbeing. We all have people or events in our lives that cause unwanted stress. It’s important to identify what triggers your stress so that you can work on figuring out how to interpret and address those situations properly. Sometimes, stress can be caused by our inability to handle certain difficult situations or life events. So this is why it is important to learn which strategies work best for you to be able to address and handle your stress – try talking to a friend, believing in yourself, reappraising the situation, listening to music, going for a walk, exercising or even meditating. Find the strategy that helps you manage your stress so that you can take better care of yourself. Also, it’s important to remember that there isn’t a single person on earth who lives a perfect, stress-free life. When you’re feeling stressed, overwhelmed, anxious or upset, just ask for help! And when it comes to asking for help, find people that you trust and enjoy being around – people that lift you up in your time of need and value and appreciate you. Another essential aspect of maintaining your mental and emotional health is you! It’s important that you learn to accept who you are and believe in yourself. Own your strengths and accept your weaknesses (because we all have them). No one is perfect. It is okay that you are less than perfect. Accepting that is a key ingredient of your mental and emotional wellbeing. Be grateful for the person that you are and the things that you have. Do not compare yourself to other people or talk down on yourself. Embrace who you are and enjoy the life you’ve been given!